A great substitute for flat files, these very affordable portfolios are also perfect for transporting drawings and other dry media. Work is fully protected in an acid- and lignin-free interior and enclosed in a thick, rigid paperboard that keeps paper from bending and creasing. 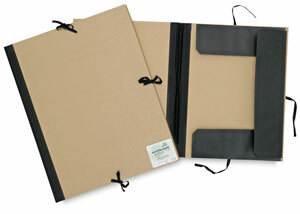 The Earthbound board cover has a moisture-resistant finish that can be wiped clean, and is made with 100% recycled material with 40% post-consumer content.